This is one of the most popular sized hasps in a bronze finish. It is an appropriate replacement hasp for many briefcase combination/ key locks however, do check dimensions and detail closely, as slight differences in design may mean certain spares won't work with your briefcase. This hasp however has a more accommodating catch which tends to make it suitable for more locks. 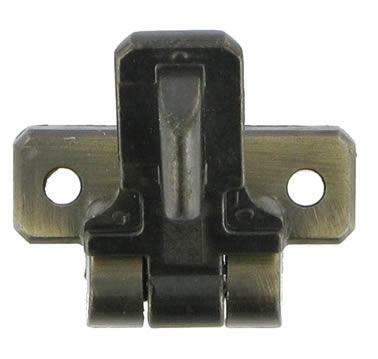 The hole in the hasp into which the latch engages is 9mm x 4mm. Dimensions 46mm (closed length) 33mm wide. Hole centres 23mm. This lock is very similar to the sbh1 but the depth of the plate with the holes in is 5mm as apposed to 4mm on the sbh1. This range of replacement parts is useful for practically minded people, who have a broken briefcase they do not want to part with and who do not have a saddler or luggage repairer in their neighbourhood.